A powerful and important new work that will help listeners develop their spiritual instincts and move from a life of fear to one of freedom. In seeking truth, success, and ultimately a happy life, there is no escaping fear; even while we may not always perceive it, fear is ever present. But what is it? What are we afraid of-really-and what can we do about it? These are the questions that Jeff Golliher answers in Moving Through Fear, a sensitive, personal, and wholly inspiring work of guidance. 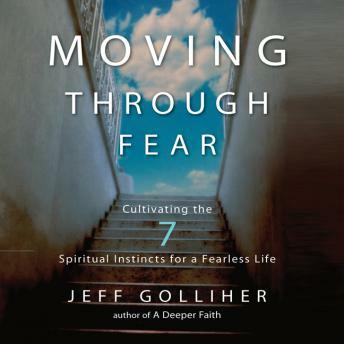 In this original and exciting work of spiritual self-help, Golliher illuminates five insights about fear, and then reveals-chapter by chapter-the seven instincts that can allow each of us to move from a life of fear to one of freedom. As we cultivate each of these seven instincts, we will in turn be creating a life where fear doesn't rule our emotions and hold our lives hostage. Through a mix of stories and anecdotes, Golliher illustrates the nature of man-from his cultivation of love and justice to the power of community-before tackling fear and its role in these aspects of our lives. Spiritual practices follow, and the reader is encouraged to develop his tools for navigating and ultimately moving through fear.